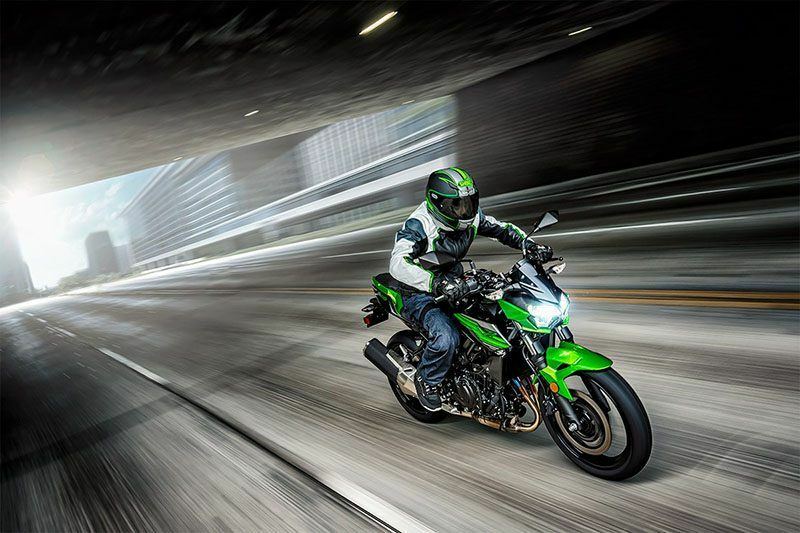 ‘New school’ gets a new contender with the entry-lightweight Kawasaki Z400 ABS motorcycle. A fierce supernaked, the Z400 ABS exudes fresh street style and is immediately recognizable in a crowd with its compact chassis and aggressive styling. 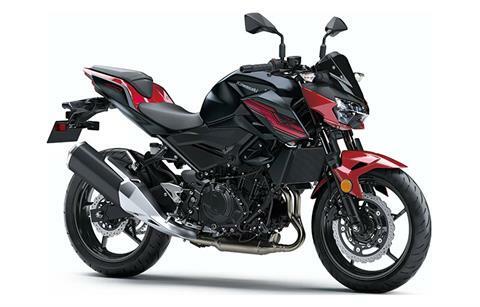 Comfortable, balanced and capable, the new Z400 ABS offers a visceral riding experience that’s sure to turn heads. 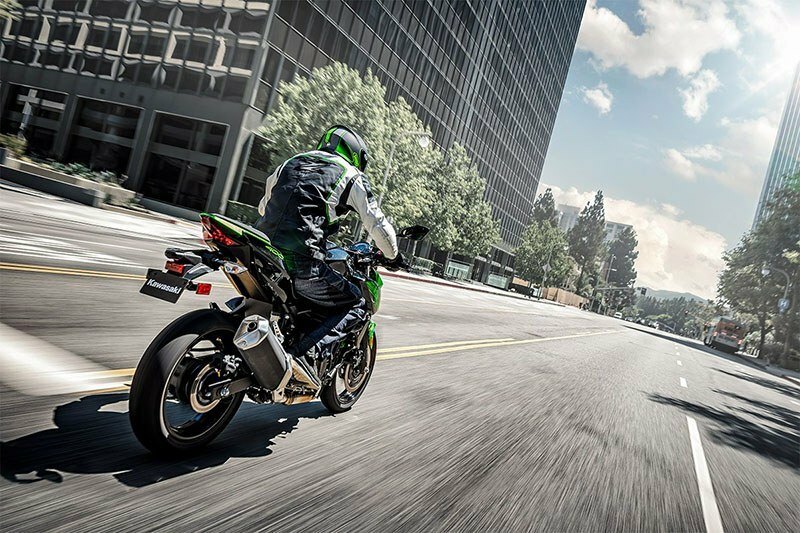 5-way preload adjustability lets riders adjust the stiffness to suit rider performance or accommodate a passenger. Stylish star-pattern 5-spoke wheels contribute to light weight and feature optimized lateral rigidity that benefits cornering stability and overall handling. A slim, lightweight trellis frame delivers a balanced riding experience with light and easy maneuvering with excellent capability at highway speeds. Built to deliver light, predictable and natural handling so you can ride with confidence. Plush suspension comes thanks to a 41mm telescopic front fork that’s tuned to provide progressive damping with a high level of feedback to the rider and responsive performance. Gripped by a balanced actuation dual-piston caliper, the Z400 ABS boasts a large 310mm semi-floating petal front disc. Nissin’s ABS control unit is compact and light weight, delivering precise control to help prevent wheel lockup under extreme braking. The wide handlebar adds leverage for dynamic control and contributes to easy maneuverability. Low seat height and slim seat design makes it easy to reach the ground during stops. Relaxed, upright riding position helps enable active control and allows for a commanding view of the road. 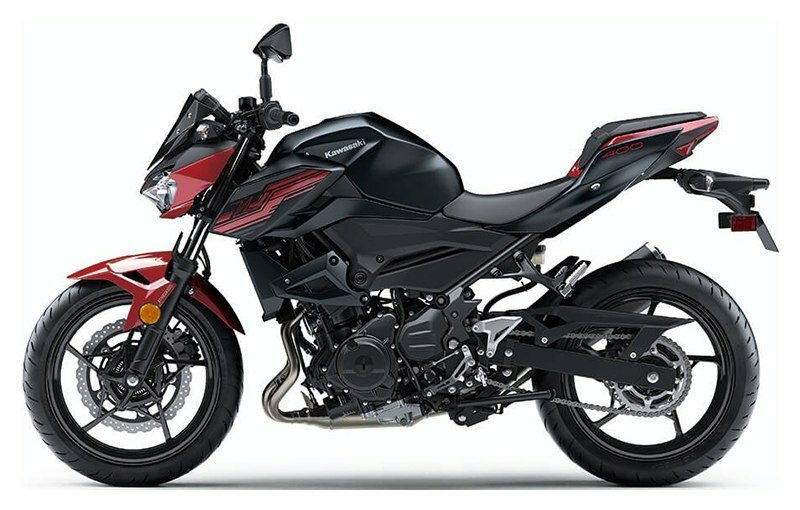 Sporty aluminum footpegs offer direct feel and are positioned slightly forward, offering a comfortable riding position and clear reach to the ground at stops. 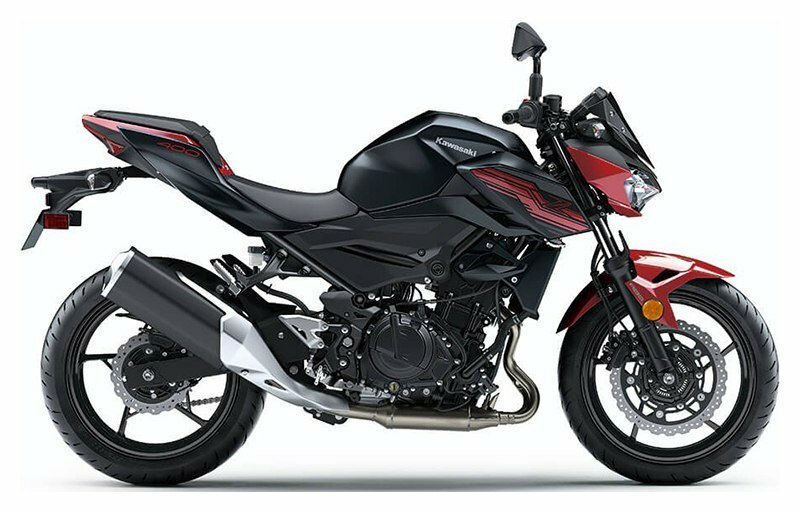 SPORTY ENGINE PERFORMANCE: Exciting power, smooth response and abundant low-end torque is produced by a the class-leading Ninja® 400 parallel-twin engine. ASSIST & SLIPPER CLUTCH: A compact clutch assists with a light feel at the lever, a wide engagement range for confident control and a back-torque limiting slipper function that helps prevent rear-wheel hop when downshifting. 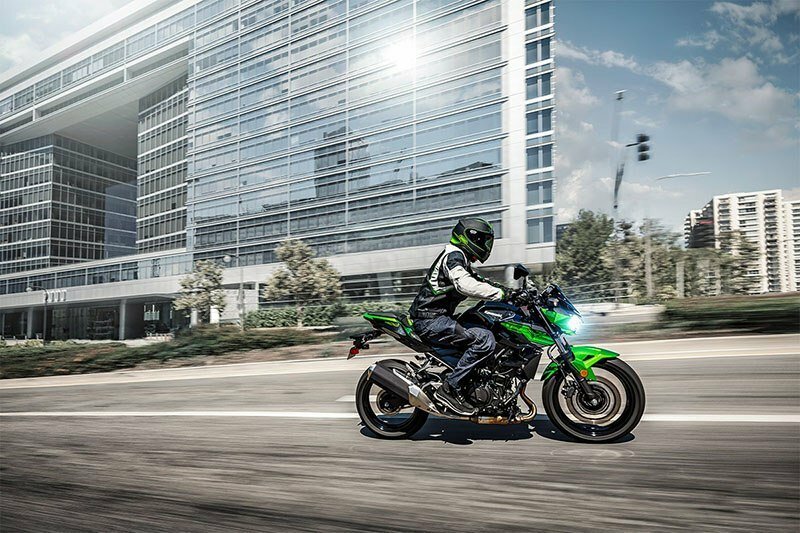 ALL EYES ON YOU: Taking cues from its Z stablemates, the unmistakable streetfighter styling backs up the aggressive attitude. AGGRESSIVE AND AGILE IMPRESSION: Edgy, minimalist bodywork is influenced by Sugomi™, a design that inspires sharp styling, dynamic performance and a distinct silhouette. MODERN LED HEADLIGHT, TAILLIGHT AND BRAKE LIGHT: Quad LED headlamp is highly visible and offers significant brightness and a wide illuminated path. 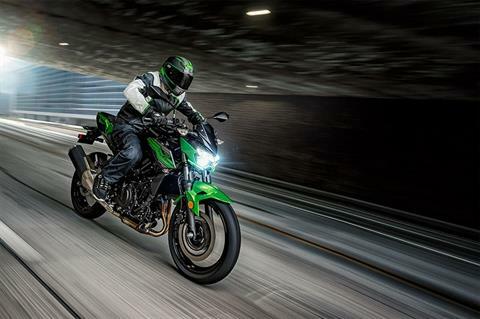 SPORTY DESIGN WITH PRACTICAL APPLICATIONS: The angular design of the front cowl is complemented by a compact, dark meter visor that adds to the aggressive looks. 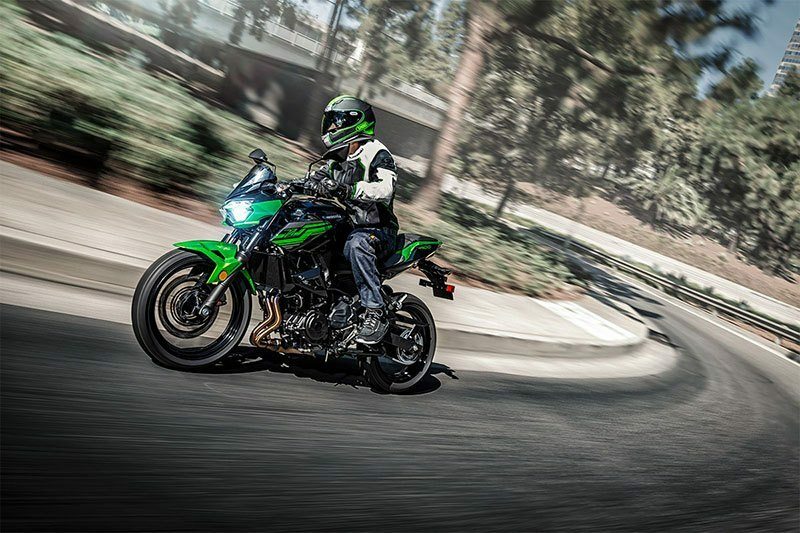 EXPOSED TRELLIS FRAME: Similar in design to that of the Ninja H2™, the trellis frame design adds to the technical and lightweight image in distinct supernaked style. HIGH-GRADE COCKPIT: Stacked instrument cluster features a clean and easy-to-read analog tachometer and multi-function LCD screen with gear position indicator fuel and temp gauges, economical riding indicator and more.